I have some experimental data which needs to be fitted so we can elucidate x value for certain y value. Data is not fitted correctly. Help would be much appreciated. 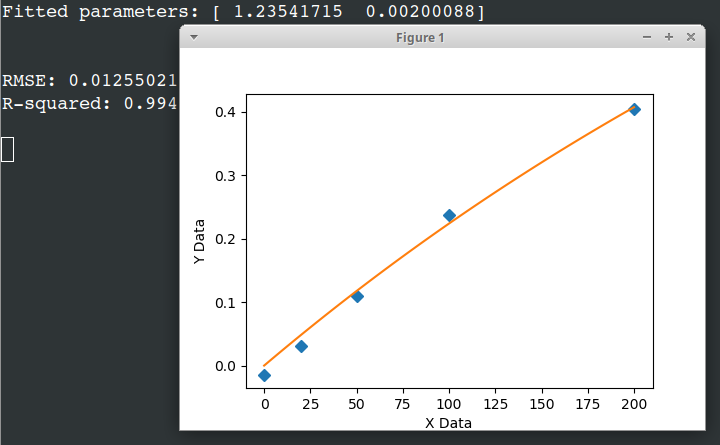 Here is an example graphical fitter using your data and equation, with scipy's differential_evolution genetic algorithm used to supply initial parameter estimates. The scipy implementation of Differential Evolution ises the Latin Hypercube algorithm to ensure a thorough search of parameter space, and this requires bounds within which to search. In this example I have used the data maximum and minimum values as search bounds, this seems to work in this case. Note that it is much easier to find ranges within which to search than specific values. Not the answer you're looking for? Browse other questions tagged python-3.x curve-fitting or ask your own question. What is the correct syntax for 'else if'? Correct fitting with scipy curve_fit including errors in x? How to improve bad fit of scipy's curve_fit?